We are so, so ready for the summer months over here and I cannot believe that Ella is only days away from graduating kindergarten! As much as it breaks my heart a little bit that she’s another year older with kindergarten nearly behind her, I’m just so ready to spend all day, every day with both Ella and Noah. Each morning while I’m making the kids breakfast, we talk about our slow summer days and how we’re excitedly anticipating the start of summer vacation. Because we truly do experience four distinct seasons where we live, it’s so important to make the most of the warmer months. I try to create bucket lists with Ella and Noah for each season, and especially around the holidays, so we can make the most of our time spent together with gentle reminders to be present and focus on what really matters throughout our busier days – making memories. To make this summer extra exciting we’ve teamed up with FIASCO gelato to give 1 family here in Canada an entire summers worth of delicious gelato & sorbetto!!!! We are hosting this giveaway here on the blog AND on Instagram so you can enter on both platforms or just the one, totally up to you. To enter here you must be subscribed to our blog and comment below letting us know which Fiasco flavour is your favourite, or which flavours you’d love to try this summer! Winner will be announced at the bottom of this post on August 7th! Good luck guys. 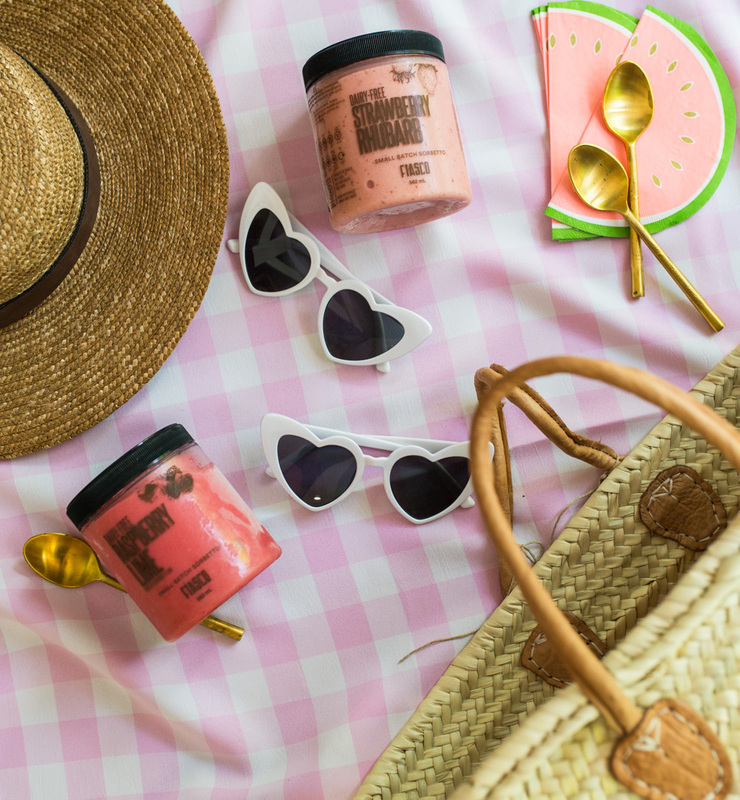 Here’s a little peek at what we’ve got planned and don’t forget to print your free printable Summer Bucket List below! 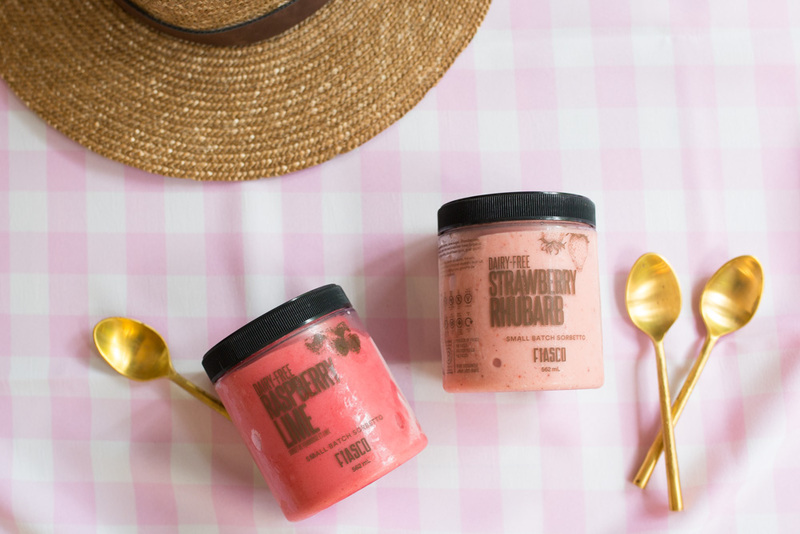 Endless indulging in our favourite pints of Fiasco Gelato & Sorbetto! I grew up with a love for ice cream but the older I got, I realized my intolerance for dairy. I was so excited when I stumbled upon Fiasco gelato a few years back in our local grocer. The summer flavours are my favourite, well actually I love the flavours all year round haha! But this summer we have been indulging on the Strawberry Rhubarb, Raspberry Lime and the Blueberry Basil. You must try them all if you haven’t already – we love having a healthier alternative to ice cream that the entire family can enjoy! These gelatos are Canadian made and made with love, the products are cruelty-free, vegan friendly, fat-free and they have gluten-free options too. Their delicious pints come in containers that are re-usable! Host outdoor movie nights in our backyard, complete with classic films, glowy string lights, and layers of blankets and pillows for snuggling. I’m thinking The Goonies for our premiere! Berry picking at a local produce farm followed by homemade strawberry hand pies. How adorably scrumptious do these ones look?! Surprise backyard water balloon fight – Mommy and Daddy versus Ella and Noah! Weekly hikes in our favourite forests. Prepare an entire meal using only fresh ingredients straight from our garden. Create a s’mores bar for dessert when we’re hosting friends and family, including our favourite marshmallows made from scratch. Plan a picnic date night for Craig and me. I’m thinking down at the beach and under the stars. Chilled rosé most definitely included. Take a weekend road trip and explore somewhere completely new. Head to the local drive-in wearing our pajamas to catch a movie with the kids. 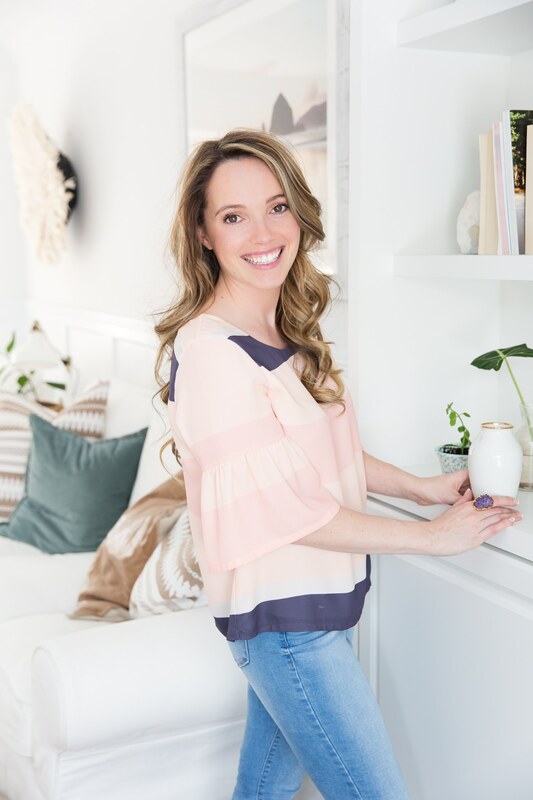 Craig and I used to have so many date nights there – we love sharing the nostalgia with the kids every summer, we’ve been taking Ella since she was a little baby! Plan a “Yes Day!” with Ella and Noah. What to do, where to go, how we get there, what to eat, when to do what, we just say yes for an entire day and see how the adventure unfolds! Start the morning with sprinklers, end the evening with sparklers. Set out to spend the entire day outdoors! Read 100 new books. We plan to stock up on new stories from Chapters, the library, and swapping with friends, to reach our goal of reading 100 books over the summer. Complete one act of random kindness with the kids each week – for example, leaving random notes of happiness throughout our neighbourhood, baking a batch of cookies for a neighbor, or delivering a small bouquet of flowers to friends nearby. Plan day dates for Ella and Noah – I can’t wait to surprise them each with a day tailored to them individually. We’d love to hear your family plans are for the summer – with two whole months of summer fun to indulge in, we can surely squeeze in a few more bucket list adventures so let us know! And can you guys guess what Ella and Noah are most excited about?! A big thanks to FIASCO for sponsoring this blog post, we’ve been fans of their products for a longtime and we are so excited to be working together this summer. All opinions are my own and we truly appreciate the support of our readers & sponsors! I want to try the Creamy Coconut. Looks delicious. The Strawberry Rhubarb is amazing and I can’t resist the Dairy-free Dark Chocolate!!! So yummy and love that is is Canadian! Carmel sea salt ! Omg. Two of my favourite flavours ! and bourbon vanilla bean ! Can never go wrong with vanilla bean ! I haven’t tried the caramel sea salt yet but I hear it’s amazing!!! the new one is gluten free coming out too!!! I’ve messaged Fiasco to see if they ship to residential areas in Ontario. Have you by any chance checked their website for “where to buy”? Strawberry Rhubarb, Raspberry Lime and the Blueberry Basil these flavours sound delightful!!! I love your summer list too. A few things on mine are beach days, berry picking, a concert or two, Netflix binge day, family picnic and to find a field filled with sunflowers … I know my summer lists will change once I have kid’s. I’d love to try the blueberry greek yogurt gelato flavour. Just thinking about it makes my mouth water! Dark chocolate Carmel sea salt and raspberry lime!!! There’s only a handful of flavours available at our local metro, I wish they were available in other grocery stores as well! It’s my favourite gelato! I always go for coffee toffee but I’m dying to try the others! What city are you in? Have you looked at there “where to buy” area on their website??? I can’t believe I still haven’t tried that one!! !